You're investigating the death family member and stumble across a centuries-old cult conspiring to wipe out the human race. Or you're just sitting down for a meal at your favorite local diner and a couple days later you're on a rocket ship attempting to stop an asteroid from colliding with the Earth. Things can never be simple, can they? Apparently not, as video games are rarely ever about some minor, one-off event. Sure, they might start small - investigate this robbery, save this person from some immediate threat - but by the time the credits start to roll, you've travelled through time, uncovered a massive government conspiracy that would put the Illuminati to shame, and concocted the world's greatest ice cream sundae. These are some of the more ridiculous examples where a tiny, isolated incident blossomed out of control way too quickly. It's not that simple. See, as Max digs into this case, he finds a vast conspiracy, first started by the US Government in the 1990s. Valkyr was originally part of the Valhalla Project, an experimental program that attempted to create a super serum for soldiers that ultimately had some nasty side effects. Max's wife found out a little bit too much, the CEO of the corporation responsible for producing it discovered that she knew too much and, well, here we are. Oh! And let's throw in a secret cabal known as the Inner Circle, a group capable of influencing government actions, for good measure. I know government conspiracies are supposed to be complicated, but damn, this is incredible. With a name like Resident Evil, you know you're in for something that's at least a little bit more involved than a typical murder plot, but that's exactly how the first game in the series starts. There have been a string of mysterious murders around Raccoon City, in which the victims appear to have been attacked by cannibals. In response, the local police department sends its best officers, the S.T.A.R.S team, to investigate. What they find is far more involved than a crazy person that enjoys nibbling on the occasion bit of human flesh. Once the team takes refuge inside of a mysterious mansion, they find that the entire building is overrun with undead zombies, and that's what's been randomly attacking people. But even if it were "just zombies," that'd still be a fairly simple explanation. Oh no, the team also discovers that a huge pharmaceutical conglomerate known as the Umbrella Corporation has been developing a weaponized virus, capable of turning innocent civilians into these shambling undead walkers, and one of the members on your team is actively working for them. Hope you've got a master of unlocking with you to help out. It all starts at a boring little festival. You meet up with a young girl, and you both take a shine to each other. You wander the booths, checking out the candy, the games, the wares Geez, she sure is taking a while to browse through those wares. Anyway, you finally make it to your genius friend's teleportation demonstration, which, of course, goes completely haywire. Now, you've got to rescue your new lady friend (who turns out to be a princess) by travelling back in time. That's one hell of a first date. Little do you know that this minor fudging with the space time continuum has set in motion a series of events that throws our heroes on a quest to save the planet from utter devastation by the year 2000. You'll travel to prehistoric times, to the Dark Ages, even to the future, in order to put a stop to the world devourer Lavos. So I guess it's a good thing you had to wait a while for that girl to browse through a handful of lollipops; otherwise we'd all be pretty much screwed right now. The "simple case becomes convoluted mess" plot structure is such a standard of film noir that it's practically a bullet point on a how-to checklist between "heavy use of shadow" and "femme fatale." So, in trying to create L.A. Noire, the developers at Team Bondi would of course come up with a plot that would throw private detective Sam Spade for a complete loop. In L.A. Noire, you're Cole Phelps, a beat cop working simple cases. But this wacky arsonist keeps burning buildings down in the periphery of the plot, and eventually your investigations start to follow this series of seemingly unimportant house fires. By the game's end, you discover that this arsonist has been working for the Suburban Redevelopment Fund, and has been torching the property of people who aren't willing to sell off their houses, thus fueling a much larger insurance fraud scheme. It's actually a similar plot to the classic neo-noir film Chinatown; simply exchange "insurance fraud" for "irrigation scheme." The dead eyes, however, belong entirely to L.A. Noire. It sounded so easy. Just deliver the stupid poker chip. What could go wrong? Everything, apparently, as you've been shot in the head and left for dead. So out of the gate, your motivation is: 1) get that chip back and deliver it to where it needs to go, and 2) get revenge on the jerk who put a bullet in your brainpan. By the end of the game well, let's just say thing get a little bit out of hand. It turns out that the chip you were supposed to deliver contains data that can significantly upgrade Securitron robots, and everyone wants their hands on it. So, by the end of the game, you've got to decide which of the four different factions you want to take over New Vegas (or perhaps, take it over for yourself). All of this culminates over a massive war on top of the Hoover Dam; a far cry from your inauspicious beginnings with a massive head wound. Eternal Darkness starts as many of these stories do: with a murder. This time, it's Alexandra Roivas' grandfather Edward, an eccentric recluse who spent his whole life studying the Tome of Eternal Darkness. His mysterious death sparks Alexandra's investigation, as she tries to figure out exactly how a lonely guy in a giant old mansion could have died in such a grisly fashion. The answer? How about an ancient, Cthulhuian monstrosity currently poising itself to take over the universe? At the onset of Eternal Darkness, you're simply exploring the abandoned rooms of this decaying behemoth of a house, reading chapters of this eldritch encyclopedia for whatever information you can find. By the end of the game, you're fighting off the alien abomination and its undead protege to save the world from a fate worse than death. Can't anyone just die of old age any more? In Shadowrun Returns' vision of the future, Seattle's rainy streets are filled with high-rises and mega-corporations so actually, not that different from present day Seattle, except all of the coffee is made from soy (yuck). In this bleak depiction of the Pacific Northwest, you've received a dead man switch - basically a message timed to play when its owner dies - from your old partner, and you're determined to get to the bottom of his untimely demise. What starts as a fairly typical cyber-noir story (well, if by typical you mean a world with magic-wielding elves and brutish trolls) quickly descends into madness. You discover that your buddy was the victim of a massive organ harvesting plot, targeting dozens of people across the city. If that weren't enough, you then learn that this plot was actually being overseen by the Universal Brotherhood, a cult attempting to summon a hive of extra-dimensional insects to consume Seattle and other major cities across the globe. And yet, there still isn't a single flying car to be found in the future. Go figure. The battle between Earth and the Covenant has raged for years, Halo follows one such fight onto a giant terraformed ring hovering above an alien planet. Things are all typically sci-fi for a while - gruff space marine fights scores of purple extraterrestrials while an oddly sexualized AI cheers him on - but things take a turn for the extreme once you find out that the giant ring you're running around isn't just there to be some alien's ideal backyard. Nope, it turns out that the Halo was created to wipe out all sentient life forms, and that this particular Halo is just one of many. Why would someone make a weapon like this, you might ask? Well, it's because of the Flood, a race of zombie-like mutants and pus-sacks, and their unquenchable thirst to turn every living organism into one of them. So wait, the answer to the life-ending Flood is to end all life so the Flood can't spread? That's child logic: I can't play with my toys so I'm going to break them so no one else can. It's best not to think too much about the logic of ancient "intelligent" species and just blow the damn thing up. Indigo Prophecy starts out simple enough in a tiny, inconspicuous diner. Sure, you end up possessed by some unknown entity and are forced to murder someone. But even barring all the mystical mumbo jumbo, your goals are simple at the game's outset: avoid the cops for as long as possible, and find out who the hell took over your body and made you stab a random diner patron. Then things get weird. Apparently, one of the side effects of being possessed requires that you start seeing visions of a strange alien life form that are so vivid you're hopping over cubicle walls like an American Gladiator. You also discover that your little body takeover was caused by a Mayan Oracle, a man living far past his expiration date who is trying to find the location of the "Indigo Child." Who's that? Oh, just a kid who may hold the secrets of the universe in her noggin. Then the third act rolls around, and things get real strange. You die, get brought back to life by a powerful artificial intelligence, and now you've got Matrix-like kung fu skills. All this because you had a hankering for chicken-fried steak. And there you have it, some of the most ridiculously escalating plots in video game history. Now that I've finished writing this, I'm assuming I'll be inexplicably whisked away on a globe-trotting adventure to find the lost city of El Dorado. I'll just sit here and wait, but while I'm hanging out, let me know your favorite crazy video game stories in the comments below! 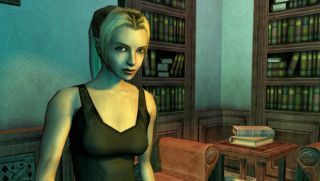 While you're waiting for your own quest to start, be sure to check out this list of evil copies of video game do-gooders, or 13 important moral lessons we learned from video games.